Saturday morning looked like it was going to be beautiful so once again we high-tailed it out to go, see, do: Flossenbürg or bust! Just a short 40 min drive away right near the Czech-Germany border is the little 1,600 person town of Flossenbürg. The town's roots go back to the year 948. Fox and his current smile, I love it so. Up above the town are the ruins of the castle. Kids in a castle. 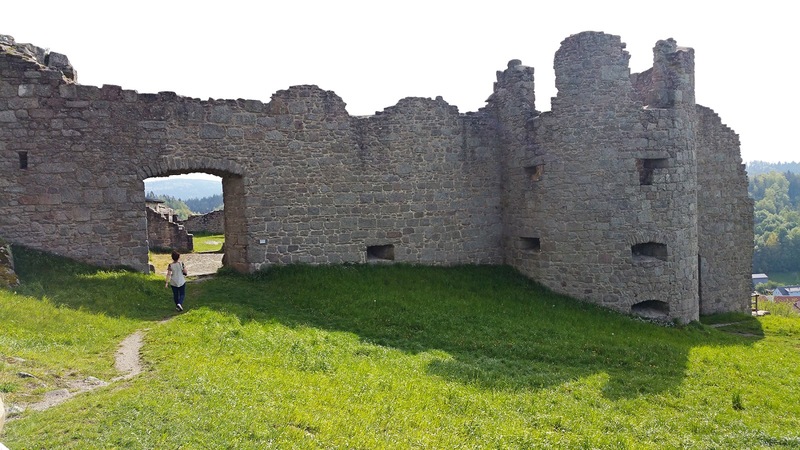 Construction on the castle began around the year 1100 and it was once a stronghold of the Hohenstaufen dynasty kings during the middle ages. Much of the damage to the castle came as a result of the Thirty Years War. Watch out for falling rocks! Fox pondering the beauty of creation. Or most likely he was thinking about Ninja Turtles. Or Minecraft. Or some new iPad game. The hike up to the castle from the parking area is only about 300-400 meters and is a pretty easy climb. 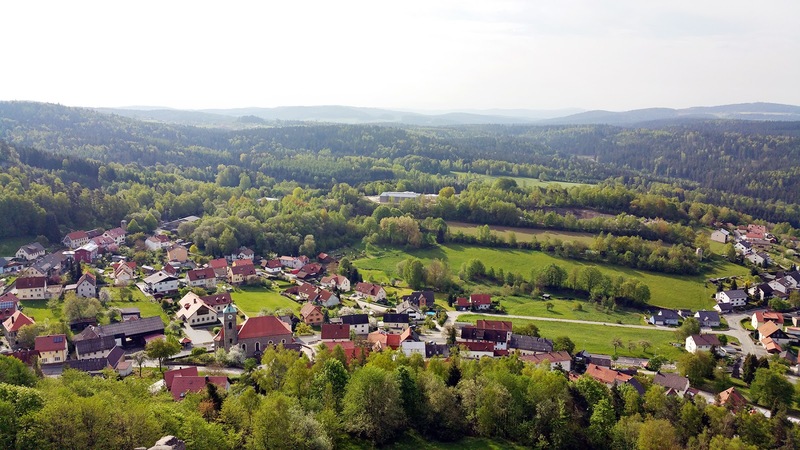 By the time you get to the to top you have great views of the Oberfalz countryside. The plaque marking the top of the castle. Looking down over the town and out to the Czech Republic. It is just so pretty here. Ball and chain, lol. 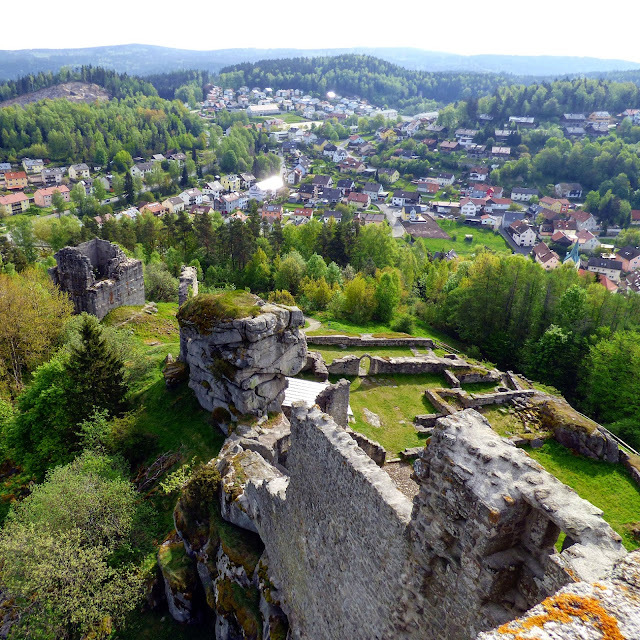 Flossenbürg, both castle and town. Lovely Bavaria (or Bayern in German). On the top of the tower ruins is a viewing platform with a cool marker pointing to various areas of interest. Even the Rauher Kulm was on it! We walked down from the top of the tower and explored the rest of the site. It reminded us of ruins around Ireland. Our family at Flossenbürg on Saturday morning May 14th 2016. 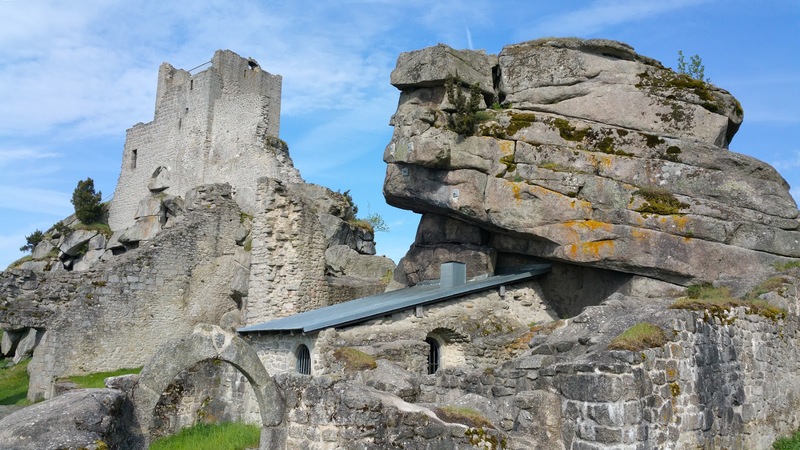 Aside from the castle, Flossenbürg is also known for the concentration camp that was here during the Second World War. The camp was opened in 1938 by the SS and served as a labor camp for the nearby granite quarries. Between 1938 and 1945 approximately 100,000 men and women from over thirty countries were imprisoned in the camp here. The site has a small, well-done museum. This picture in the museum shows all the concentration camps and sub-camps that were set up by the Nazis. The washing room. Flossenbürg was a labor camp, not an extermination camp, so these showers were actually showers. A picture in the museum showing the camp run by the SS and castle ruins above it. A picture of the prisoners quarrying nearby granite from the hills. The site today as a solemn, peaceful memorial to those who were imprisoned or died here. This was known as the "Valley of the Dead" because it was the killing grounds and the location of the crematorium. Today, a monument set up like a Christian "Stations of the Cross" path winds down into the valley. 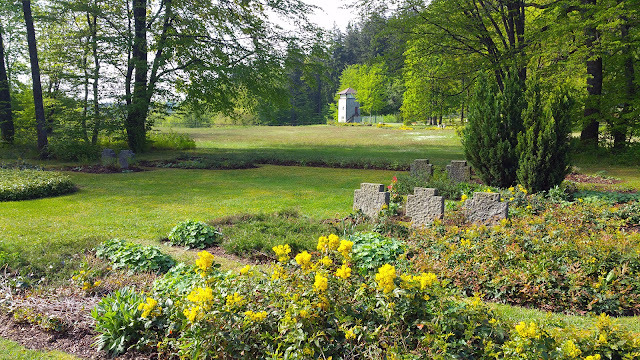 The plaque in front of the mound reads: "These are the ashes and bones from mass-burnings." A Christian memorial chapel is situated above the valley near an old guard tower. Inside the chapel plaques show country flags and the number of people from that land that were imprisoned here. A stained-glass window depicting a colored triangle and number like all the prisoners were forced to wear. A humbling morning for sure also filled with beauty and love. Wow ... that is extremely moving... so sad that so many suffered during that time! Loving all the photos -- thanks for sharing these!